Marcello Diotallevi was born on 24 April, 1942 in Fano. He lived in Rome from 1946 to 1974, and for a period of about ten years he worked as a restorer at the Vatican restoration workshop. His artistic career began in that same period and was immediately marked by restlessness. In the early-seventies, he was first of all a painter and then a sculptor. Later, he took an interest in graphics and finally began writing. Towards the end of the seventies, he took his first steps into Mail Art and Visual Poetry. In over forty years of ongoing activity, he has contributed to books and Italian and foreign magazines. He has given one-man exhibitions in major cities in Italy and abroad, taking part at the same time in collective exhibitions all over the world. His is a member of the artistic group “I metanetworker in spirit”. 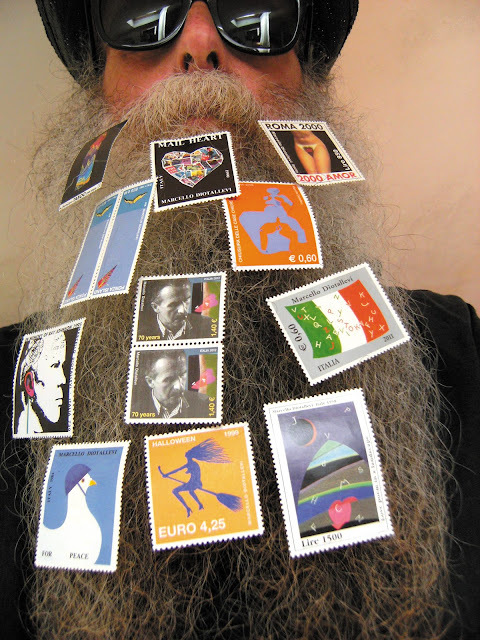 His work focuses mainly on Visual Poetry, Mail Art, installations, artist books and Performance. He designed the cover of the Guide to the Musée National d’Art Moderne-Centre Georges Pompidou in Paris (Hazan Editeur, 1983). In 2007 he was invited to the 52nd Venice Biennial Exhibition, "Room 312 - remembering Pierre Restany". He is also mentioned by Giorgio Di Genova in his work "Italian History of Art, the Forties Generation", Bora Publisher, Bologna 2007. He lives and works in Fano.